“Every rose has its thorn:- you never find a woman without pins and needles”. 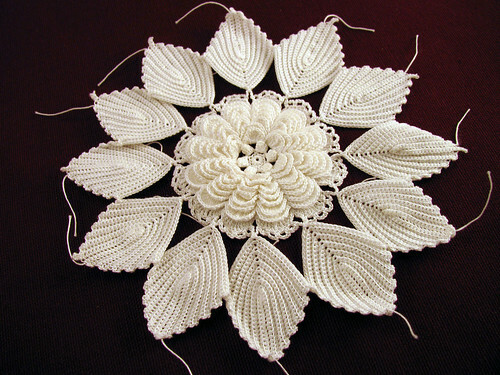 Douglas Jerrold said that as if it was a bad thing….Here is the start of another doily. Even though the ends are woven in, I always leave the tail of thread until the after the crochet piece is blocked. That way if an area needs to be adjusted I still have a working thread to do it with. It also makes sure that the ends don’t pop out and then either have to be cut dangerously close or painstakingly pushed back under the stitches. It does make the work look messy longer, but the end result is neater and that is what counts. This entry was posted on Friday, January 23rd, 2009 at 3:00 am and is filed under Crochet and Lace. Tagged: Crochet, Doily, Lace, Thread. You can feed this entry. You can leave a response, or trackback from your own site.